There have been leaks and more leaks where the Kaveri APU is concerned. Well, we are now getting reports from Chinese sources that Kaveri is not getting GDDR5 Support after all and will utilize DDR3. Kaveri APU to Continue Use of DDR3 Memory – AMD stops GDDR5 Support. As Always keep your pinch of salt handy, but these sources are usually quite reliable. The Kaveri APU will be manufactured from a TSMC 28nm process and previous leaks varied of GDDR5 and DDR3 Memory being utilized. Now however we believe that AMD has ditched GDDR5 in favor of DDR3 Memory. This will include the higher end ‘Bald Eagle’ APU. However this might not be that bad a thing. GDDR5 and DDR3 Memories have subtle differences and though a GPU usually benefits from GDDR5 as opposed to DDR3 but Kaveri is not a pure GPU. DDR3 runs at a higher voltage than the GDDR5 memory and of course there is the bandwidth problem. By nature DDR3 is limited to 64 bit or 128 bit (64×2). While as the GDDR5 memory is usually upto 384 bits. Now thing is, kaveri apu probably does not need more than 128 bit memory. However using GDDR5 could be quite useful too, if AMD means for the APU be taken seriously the individual component performance must go up. Dual Channel DDR3-2133 Mhz memory would give you about 35 Gb/s while GDDR5 would give you 70Gb/s. Kaveri will already utilize the Steamroller Architecture and Graphic Core Next Architecture so this generation of APU is sure to be good. Previously leaked benchmarks also support the claim. 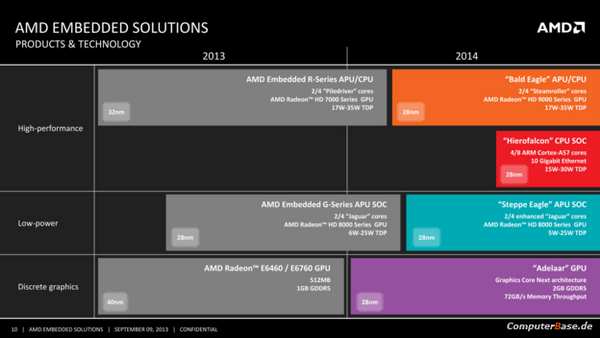 And of course the last logical argument remains the same, APUs are AMD’s prodigy, they are not about to ruin it.